Israel has shortlisted over 20,000 Palestinian homes for demolition in East Jerusalem al-Quds, reports the Jerusalem Center for Social and Economic Rights (JCSER). The reason behind the move is that they were built without Israeli construction licenses, the center's head, Ziad Hamouri, said on Saturday. Hamouri went on to say that Israel uses the licenses, which are rarely approved, as an excuse to remove Palestinians from the occupied city. Even if the licenses are approved, he said, they take five to eight years to be issued and cost from $30,000 t0 $50,000 each. "The Israeli demands for a construction license are punitive financially and procedurally," Hamouri noted, adding such regulations do not apply to the Israeli settlers living in the city. On February 9, Israeli media reported that Tel Aviv had seized about four square-kilometers of Palestinian land near the settlements of Kedumim, Vered Yericho, Neveh Tzuf, and Emanuel. According to reports, Israel has made preparations to construct 18 residential projects in these areas, with more than 99 percent of the occupied land being allocated to settlements. Israel is facing widespread global condemnation over its settlement construction in the occupied Palestinian lands. The EU has often criticized Israel for building thousands of settlement units in the occupied Palestinian territories. The presence and continued expansion of Israeli settlements in occupied Palestine has created a major obstacle in the way of efforts to establish peace in the Middle East. Upwards of half a million Israelis live in more than 120 settlements built since Israel’s occupation of the Palestinian territories of the West Bank, including East al-Quds, in 1967. The Israeli settlements are considered to be illegal by the United Nations and most countries because the territories were captured by Israel in the war in 1967 and are thus subject to the Geneva Conventions, which forbid construction on occupied lands. The Palestine Liberation Organization (PLO) issued a report on Saturday revealing that 90% of the West Bank territories confiscated by the Israeli occupation have been allocated for settlement expansion. The PLO National Office for the Defense of Land and Resistance of Settlement said the Blue Line Team of the Israeli Civil Administration has been drawing up maps with boundaries for Palestinian confiscated land in the West Bank so that construction projects and settlement expansion can be started. The report issued by the PLO Executive Committee stated that the Blue Line Team conducted last year scans to implement 18 major expansion projects on 12,840 dunums of Palestinian-owned lands. The PLO report mentioned that the Israeli Occupation Authority announced in September, 2014 that more than 35,000 dunums of the West Bank lands located near settlements were seized to set up military camps but then passed them on to settlements for expansion purposes. The Israeli Antiquities Authority (IAA) is conducting a dig in Hebron's Tel Rumeida neighbourhood, a dig which is destroying the area. While financed by Israel's Ministry of Culture and Sport, this dig was undertaken at the initiative of Israeli settlers in Hebron. The dig, the fourth in Tel Rumeida, is carried out by the IAA and the University of Ariel, located in the West Bank settlement of Ariel. While David Wilder, spokesperson for Hebron's settlers, claims all decisions related to the excavations are made by the IAA, the settlers already plan to establish an archaeological park on the site upon conclusion of the dig. The Civil Administration told the Israeli newspaper Haaretz in January that “The Antiquities Authority has been carrying out rescue excavations in Tel Hebron, following the Hebron settlers’ initiative to develop an archaeological park open to the public. The administration is endeavoring as a matter of routine to protect, develop and carry out rescue digs regardless of the future of these sites and the arrangement to be carried out in the future”. While Israel presents these as "rescue digs", already in the late 1990s the IAA was involved in an excavation of Tel Rumeida, on top of which permanent housing for the Ramat Yishai outpost was constructed from 2001. The Israeli archaeologists' group Emek Shave reports that many of the remains discovered in this previous excavation are now located under settlers’ houses and are features of a guided tour led by the settlers. Palestinians note that the current excavation in Tel Rumedia will likely be used in the future to connect between the settlement outposts in Hebron's Old City. The use of ancient sites to attract visitors and strengthen the legitimacy of settlements is known from other areas, including the City of David in East Jerusalem and Sussiya in the South Hebron Hills. Emek Shave estimates that in the case of Hebron, the combined archaeological site and view of the ancient city of Hebron and the Cave of the Patriarchs will have just such an effect, with an especially powerful emotional component. Speaking with the AIC, Hisham Sharabati of the Hebron Defense Committee stated that Hebronites "will continue to protest against this project, and all rights violations perpetuated by settlers in the city". Israeli bulldozers escorted by police forces on Thursday stormed the unrecognized Bedouin village Tel al-Meleh in the Negev and demolished a number of Palestinian homes. The homes, owned by the Abu Musa'ed family, were demolished allegedly due to unlicensed construction. Locals said that despite the freezing weather conditions in the region, the Israeli police forces acted with no mercy and displaced the citizens from their homes. They added that policemen physically assaulted and arrested Khalil Abu Musa'ed after he protested the demolition of his house. 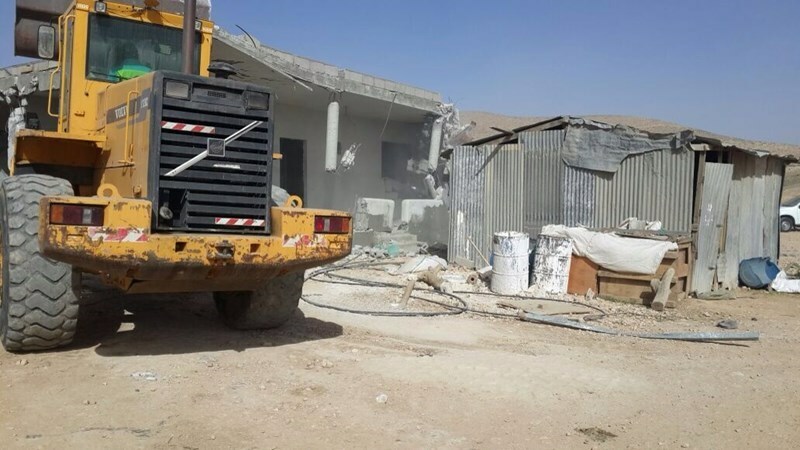 Earlier on Wednesday, the Israeli police had demolished a number of Palestinian houses in Um Batin village belonging to Abu Kaf family. Head of the regional council for the unrecognized villages Atiya al-A'asam condemned the ongoing Israeli demolition campaigns in the Negev. He said that the recent demolitions took place after right-wing Israeli minister Naftali Bennett issued threats against the Palestinians in the Negev. 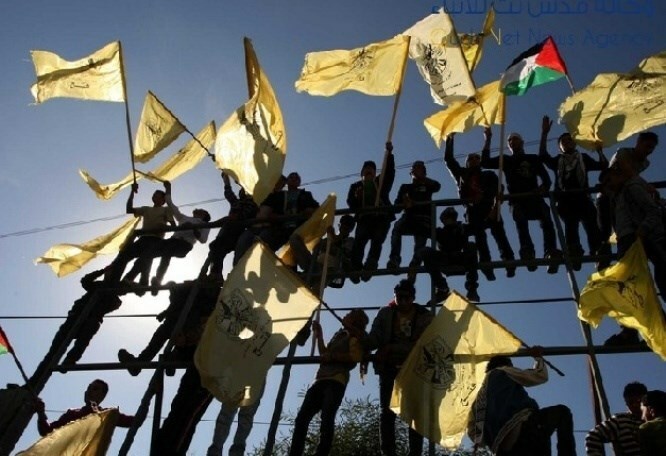 Palestinian popular resistance activists, Thursday morning, destroyed a metal gate blocking the entrance of al-Jaba village, to the southwest of Bethlehem, said a local activist. 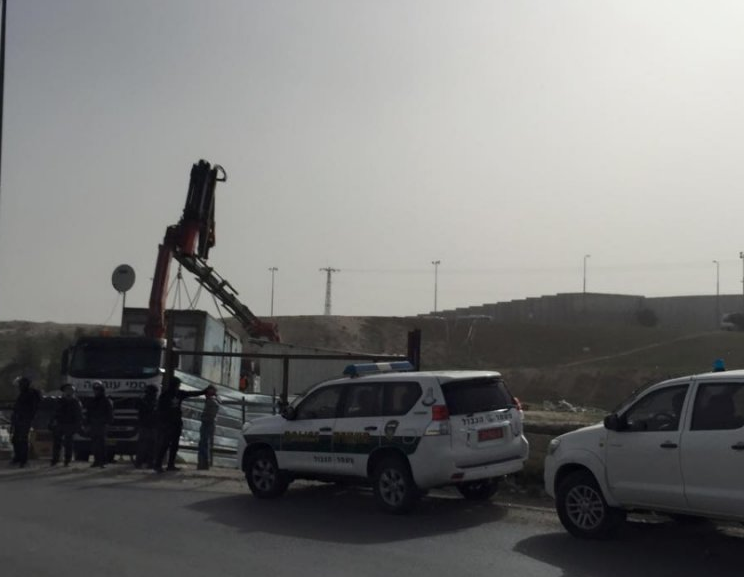 Coordinator of the Popular Resistance Committees in Southern West Bank, Muhammad Mhaisin, said that several activists destroyed the metal gate that has been blocking the road linking al-Jaba with the adjacent Hebron town of Surif for the last 14 years. According to WAFA Palestinian News & Info Agency, Mhaisin said that the gate added to the tightened Israeli closure and siege imposed on Palestinian communities in the area, making their life miserable and dividing families. The blockade was intended to make life difficult for Palestinian locals and eventually displace them, in order to seize their lands for illegal settlements and expansion purposes, and to secure the movement of settlers along the nearby by-pass road leading to the Gush Etzion settlement bloc. Israeli soldiers recently attacked a non-violent protest against the closure of the road linking between Surif and al-Jaba, firing tear gas canisters at and assaulting activists. 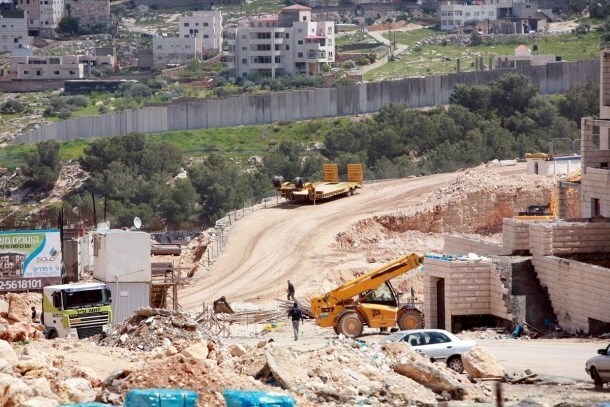 Israeli Occupation Authority (IOA) announced the confiscation of 650 dunums of Palestinian land in al-Shuyukh town to the east of al-Khalil on Thursday. The head of the village council Sharif al-Halayqah said that the IOA gave three Palestinian families confiscation notices of 650 dunums of their lands in al-Shuyukh town. Parts of the land are planted with trees, he added. He showed concern that the IOA may confiscate the entire Palestinian lands in the area which are estimated at 2000 dunums. Halayqah pointed out that the Israeli occupation confiscated last year seventy dunums of Palestinian territories near “Asfar” settlement which is established on the town’s land and turned it into farms for Jewish settlers. The Fatah Movement accused Israel of practicing a systematic ethnic cleansing policy against the Palestinian people in occupied Jerusalem, and appealed to the international community to necessarily put an end to its violations in the city. In a statement on Wednesday, Fatah said that "Israel has been executing for long years an ethnic cleansing plan in stages and currently intensified its repressive measures against the Palestinians in Jerusalem." The Israeli occupation state demolishes Palestinian homes and commercials stores, appropriates them for Jewish groups, build illegal settlements, arrests children, terrorizes the native population and puts financial pressures on them to force them to leave their city, the Movement underlined in its statement. Fatah also accused Israel of imposing a security cordon on the Old City of Jerusalem and the Aqsa Mosque, protecting its settlers' daily desecration of the Aqsa Mosque and Judaizing the Islamic and Christian Arab identity of the holy city. Israeli occupation forces for the fifth time have demolished the symbolic popular struggle village Jerusalem Gate in Abu Dis, which protests Israeli policies of demolition and ethnic cleansing, by relocating the Bedouins in east Jerusalem to the Jordan Valleys. Munther Amira, Popular struggle activist and coordinator said that the demolition was completely provocative and used bigger and stronger machinery than the last four times, in a way to point that Israel is, in fact, preparing to proceed the displacements and land bulldozing for settlement expansion. Amira assured that the parties and committees will complete their steadfastness and rebuild the village again. The Popular Resistance activists and the people of Jerusalem on Tuesday, February 3, 2015 were able to construct a number of tents. They called them "Jerusalem Gate". 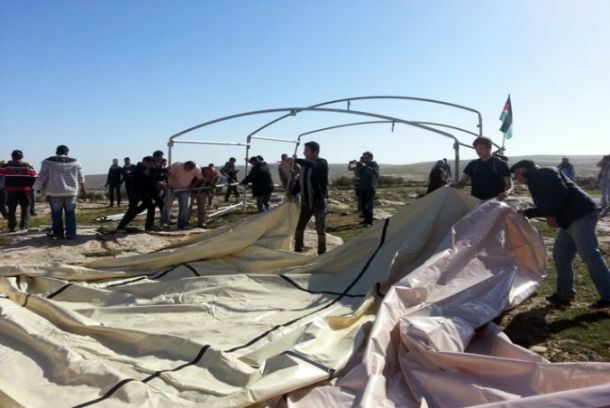 These tents were constructed as a manifestation to protest against the occupation and colonial settler policies which are practiced on Palestinian lands in East of Jerusalem, Abu Dies and Al Eizarieh, which are threatened to be confiscated. The Israeli occupation forces announced that they will demolish these tents hours after their construction. In the early morning hours of February 4/ 2015, a day after the establishment of the Jerusalem Gate, the area was raided by the Israeli army's bulldozers. The occupation army used gas bombs and stun grenades against the activists. The occupation army demolished the tents and the iron structure which the activists used to sleep in. After the brutal assault on the protesters and activists, they returned immediately to the land of Jerusalem Gate and rebuilt the tents including the remaining ones. They declared that the battle against the occupation will continue until their schemes are foiled. The popular resistance activists and the residents of the threatened land in Al Eizarieh and Abu Dis East of Jerusalem will continue to construct these tents aiming to express their rejection of and the struggle against the policy of the occupation army and its decisions which are leading to the confiscation of the Palestinian lands and the expulsion of Bedouin communities in East Jerusalem. The activists and the community managed to build several tents under the name of Jerusalem Gate in the area of Khalet Al Qamar in Abu Dis. This activity or initiative is a first step to protest against the policy of the Israeli colonial occupation. Activists will support the residents of these areas and will continue the struggle with them against the threats of the occupation army to confiscate the land. 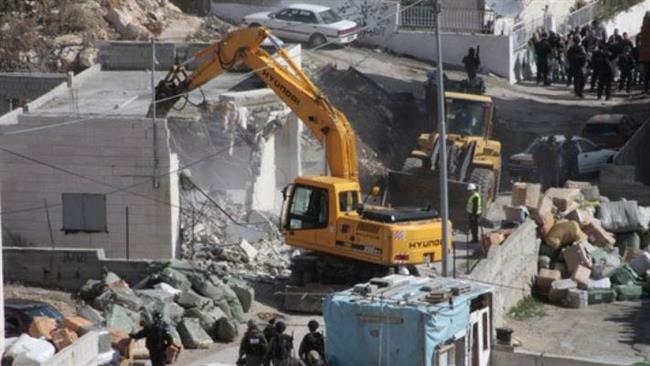 The Israeli Occupying continues its daily assault against Palestinians in these areas through the demolition of their homes, as was the case of the demolition of houses of Arab Al Ka'abneh two weeks ago. The residents of Arab Al Ka'abneh were expelled to join a larger collective of people in the Jordan Valley against their will and without any consultations with the community. This Israeli plan aims to control the land for the benefit of the colonial settlements in Jerusalem from the east. Especially large settlements like " Maale Adumim ", aiming to link east Jerusalem area in preparation for the establishment of Greater Jerusalem. The Israeli occupation is working on keeping the largest possible number of Palestinians outside the city of Jerusalem to ensure a Jewish majority . This new racist plan started in the year 2007, it is threatening more than 15,000 Palestinians, half of them are children, all living in 45 communities since Al Nakba in the year 1948, The European Union has condemned the demolitions and forced expulsion from areas occupied by "Israel". UNRWA has expressed its concern about the threat of forced displacement, and the forced displacement of people from the territory under occupation as that is a violation of International humanitarian law. "If Israeli occupation succeeds in displacing Bedouins from their homes in Abu Dis east Jerusalem, 62% of West Bank land will be seized,"
Israeli occupation bulldozers this morning have started the demolition of a stone manufacturer in Al-Tur village East Jerusalem under the pretext of having no building permit. The owner of the factory, Nidal Abu Sbitan, said that it has been working for 5 years now and is source of livelihood to 6 families. The manufactory was built on Abu-Sbitan's private property of 2 dunums width, and recently received demolition threat saying that "it had no building permission." Abu Sbitan said that Israeli forces confiscated goods with 500,000 NIS ($130,000) worth machinery and goods from it. Local sources said that forces have closed down the area and the roads leading to the land, and prevents anyone from entering. 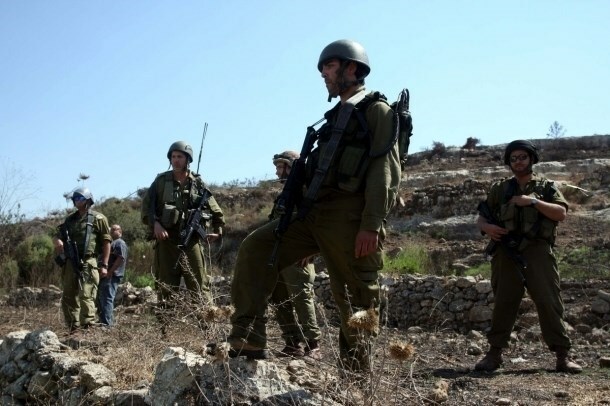 The Israeli Occupation Authorities (IOA) claimed on Wednesday the arrest of “Hamas military cell” near the villages of Jaba and Marka south of Jenin. Weapons were found in the possession of the cell members, according to Israeli press sources. The sources said that Israeli forces stormed Jaba town at dawn Wednesday and arrested a Hamas-affiliated Palestinian man and raided several homes in the town. Five other citizens including two brothers were detained during the raids. Israeli newspaper Maariv on Wednesday reported that Shin Bet had found weapons in the possession of Hamas activists in a raid carried out in Jaba town. Israeli army command claims every now and then its ability to detect and arrest resistance cells in the West Bank. Furthermore, its soldiers have stolen money and jewels from a number of local homes over the past few days. On the other hand, a young man was nabbed Wednesday afternoon after storming and searching his home in Jenin refugee camp. Several makeshift checkpoints were also erected to the south of the city, where Palestinian vehicles were stopped and searched. The Israeli Occupation Authority (IOA) issued an order confiscating 2000 dunums of Palestinian land in al-Shuyukh town to the east of al-Khalil on Wednesday. The Palestinian activist in the town Ahmad al-Halayqah told the PIC reporter that the Israeli Civil Administration marked two thousand dunums of territories belonging to three Palestinian families, with a confiscation notice. The IOA seeks to confiscate Palestinian lands in this area for settlement expansion, the activist added. Israeli occupation forces (IOF) launched at dawn Wednesday a mass arrest campaign throughout the West Bank towns and villages targeting seventeen Palestinian citizens including a leader in Hamas Movement. The Palestinian Prisoner Society documented the arrest of seven citizens from Beit Ummar town to the north of al-Khalil including six minors and teenagers: Isam Bahar, 16, Mazin Awad,19, Muhammad Ikhlayel,19, Amir Ikhlayel,16, Mahmoud Ikhlayel ,18, and Muhammad Jameel,18. In Beit al-Rush al-Fuqa village, to the west of al-Khalil, the IOF arrested the minor Zaid Hribat, 15, after storming and searching his home along with other homes in the village. The arrest campaign extended to include seven citizens from Burqin, Jaba, Mirka and Ya'bad towns, south of Jenin. The IOF also arrested Sheikh Hasan al-Wardian, 59, from Bethlehem to the south of the West Bank after storming his home at 2 a.m., ruining his belongings and furniture under the pretext of searching, and confiscating all the family money, local sources told the PIC reporter, adding that the IOF soldiers also broke into and searched the home of Wardian’s detained son Mahmoud. Sheikh Hasan al-Wardian served more than ten years in the Israeli jails and has been previously detained by the Palestinian Authority. 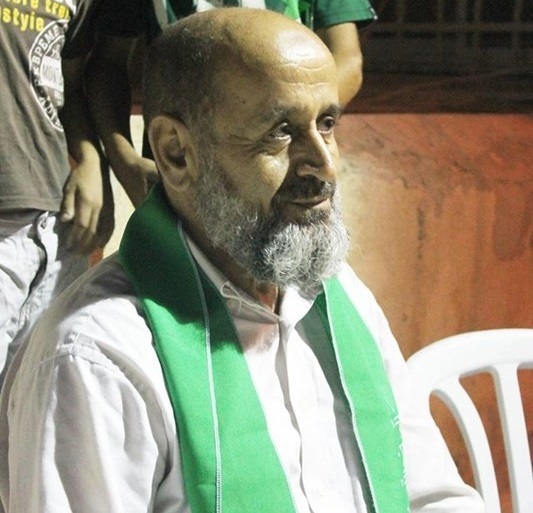 In a related context, the IOF re-arrested a newly-released detainee from al-Doha town who served many years in the Israeli jails and was released less than a month ago.